Ever want to bring your favorite artist back from the dead? Or maybe mortify a living artist? 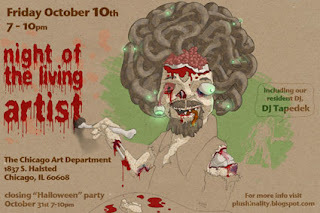 Chicago Art Department will be showing art that fit this theme, at The Night of the Living Artist, this Friday October 10th from 7-10pm. Featuring plush artist extraordinaire Kerry Flaherty. There will also be a closing for this exhibition on Halloween night! Here's a link for info, and of course more is available at www.chicagoartdepartment.org.